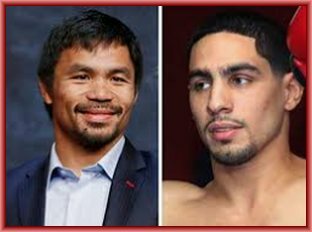 While Floyd Mayweather, Jr. is making up his mind whether or not to fight WBA welterweight champion Sen. Manny Pacquiao, former two-time world titlist Gerry Penalosa said yesterday Philadelphia brawler Danny Garcia would be a perfect opponent for the Filipino icon in case the Money Man from Grand Rapids bails out of a rematch. Thurman, 30, is the reigning super WBA welterweight ruler and is fresh from repulsing challenge Josesito Lopez on a majority 12-round decision in Brooklyn last Jan 26. Thurman was coming off a nearly two-year layoff to recover from elbow and hand injuries. His record is 29-0, with 22 KOs. Thurman looked shaky against Lopez on several occasions and was nearly brought down in the seventh round. He looms as Pacquiao’s next opponent if Mayweather isn’t available. Since Thurman is in Al Haymon’s stable with Premier Boxing Champions, it’ll be easy to arrange a fight against Pacquiao. Haymon, who is Mayweather’s adviser, has a working arrangement to co-promote Pacquiao’s fights after his split with Top Rank’s Bob Arum. Garcia, 30, is also in Haymon’s stable. What Penalosa likes about Garcia is unlike Thurman and Broner, he won’t run away from Pacquiao. The 5-8 1/2 slugger holds knockout wins over former world titlists Amir Khan, Brandon Rios, Erik Morales and Paul Malignaggi. Other former world champions he’s beaten are Nate Campbell, Kendall Holt, Zab Judah, Lamont Peterson, Lucas Matthysse and Robert Guerrero. He started his pro career with a 33-0 record, including 19 KOs, four in the first round and six in the second. Garcia’s record is 34-2, with 20 KOs and his only losses were decisions to Thurman (split) and Shawn Porter. He’s set to take on Adrian Granados, who once dropped a split decision to Broner, on April 20. Garcia is a former WBC/WBA superlightweight and WBC welterweight champion. For sure, if Garcia faces Pacquiao, the fight will be an attractive pay-per-view event. If Pacquiao’s fight against Broner drew about 425,000 hits, a duel with Garcia should easily surpass it. Garcia is a lot more explosive and exciting than Broner. But Pacquiao’s priority is to take on Mayweather in a rematch. In 2015, Pacquiao and Mayweather figured in the richest fight ever, both in pay-per-view and box office sales. Pacquiao lost a unanimous 12-round decision that was tainted because in the fourth round, the Filipino badly hurt his right shoulder and fought one-armed the rest of the way. The shoulder was injured in training camp and the affliction was aggravated during the bout.